Here we are, looking a bit younger, back in 2013! 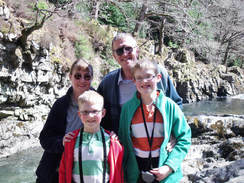 We are a home-schooling family, here in the UK, following the GAPS diet to improve our health. Only one of us parents works full time, so we have limited funds to spend on food. Our site promotes good quality natural food without breaking the bank, proving that it is possible to eat well, heal the body and be on a budget. We don't go in for flamboyant expensive equipment and ingredients, or complicated recipes - we eat real... real food, with real appetites, prepared quickly with the best quality food we can afford. Practical food for feeding a hungry family! We give practical realistic advice! ​Hence she is not a doctor and all advice concerning health is given from practical experience, or from personal reading and research. A member of the medical profession should always be consulted regarding all matters relating to your health. We hope you stay and enjoy the journey with us. Please read our story, below. We started the GAPS diet in Feburary 2016. Here we introduce ourselves. Husband was diagnosed with Graves disease - an auto-immune condition, August 2015. He is on medication to control his over-active thyroid, but the medics are keen to give him radioactive treatment to zap his thyroid as it is not responding to treatment very well. Husband is keen to try a natural approach, if not to put it into remission, to help restore the health of his gut and health in general. He seems now to be responding to the diet, with improving blood test results, and gradually reducing medicine. Suffers from dyspraxic type symptoms with associated poor co-ordination and organisational skills, low muscle tone and hearing and taste sensitivities. He was very late talking. Also has moderate eczema in summer months. Stutters mildly. The stutter has now gone - went soon after implementing the diet. Concentration heaps better. Eating well and with good exercise, muscles are strengthening. Eczema almost non-existent, an occasional few spots. I have an under-active thyroid and also suffered symptoms of i.b.s. on and off. Have suffered badly from anxiety. Also had migraines. The i.b.s has now gone, The anxiety only slightly evident when I'm tired. The migraines disappeared once I came off of gluten. The fittest of us, but has had asthma when younger. Still has had congestion on cold winter mornings. Winter congestion gone, asthma seems to have gone too with it. Seven years ago I was telling my friend that Son 1 was anaemic and she gave me a copy of 'Nourishing Traditions'. I read it and must admit I thought it the weirdest cookbook I'd ever read, If you've never heard of it, it is a book calling us back to traditional ways of preparing food and advocating not using refined sugar and white flour due to the harm they do to our bodies. It also stresses that our bodies need natural saturated animal fats, like butter, in high quantities - so flying in the face of 'politically correct nutrition and the diet dictocrats' (Nourishing Traditions by Sally Fallon). It made sense, but I'd never heard of soaking grains, or fermenting vegetables! We liked the idea of cream and butter though, so we ditched the margarine and semi-skimmed milk. It was rather hard to cut out sugar but we did reduce the amount. I stopped buying 'Ribena' and 'from concentrate' juices and switched to letting them have a centimetre of freshly pressed pasteurised juice in a glass of water once a day. Husband has always been happy drinking water, so they were happy to copy him. We also stopped having boxed cereals and started soaking our breakfast grains. Husband loved his with LOTS of cream! I was given a bread maker and started making my own wholemeal bread. I began to suspect that Son 1 wasn't absorbing his food as he should as we ate plenty of iron-rich foods. A couple of years later he was vitamin D deficient too, and then anaemic again and this continued on and off. I did lots of research on the web to see if anything would help him, and did find the GAPS diet. I read all about it but realised the chances of my family ever coming off their chocolate and cakes was very slim, so resigned to forget the idea and carry on doing my best to help him. Every now and then I would pick up Nourishing Traditions and have another look. Gradually I replaced more and more foods with home-made alternatives. but sourdough and fermented vegetables still seemed rather extreme. I did try experimenting with soaked bread, but never found a suitable recipe until very recently on the Weston Price Website. Fast forward to finding GNOWFGLINS http://gnowfglins.com/ and here was a wealth of practical help! Thank you Wardee, you have so blessed our family. I was so taken up with trying recipes and learning new skills - yes soaked grains became the norm and now I'm into dabbling with fermented vegetables! I have even got to grips with sourdough, though sadly it's been put in the bin while we do GAPS, but I know that I have a store of delicious recipes to turn to if we can put grains back in our diet eventually. Just by making this small change, my son hasn't been anaemic for some time and looks rosier than he ever has. I (wife) have had tons more energy and no longer wake with a tired dragging feeling behind the eyes. Son 2 hasn't had an asthma attack for over a year. And then through Wardee's website I found eat-beautiful http://eatbeautiful.net/ and bought Megan's 'Grain Free and Lovin it' cook book. This took my baking on to a new dimension as I experimented with baking with nuts. I held on to the thought that if I could convince my family they could eat well on the GAPS diet, they might be persuaded, but it became a sort of threat. Eczema was a sign he needed GAPS! Asthma? GAPS. I think my hinting wore thin! .....Until husband became ill. I did lots of research on the internet and found to my surprise GAPS could help autoimmunity too, i.e.. Graves disease for us! Well I never. Did I dare suggest it? Well thanks to these two lovely ladies, my family know that when we get onto full GAPS we can enjoy eating - and REALLY ENJOY eating! So much so, that although we all fear getting through the intro stage, we are (at least the parents) 100% committed to trying it. This diet is only temporary, so hopefully, before too long we can return to our sourdough - but hopefully leave our dependence on grains and sugar behind. 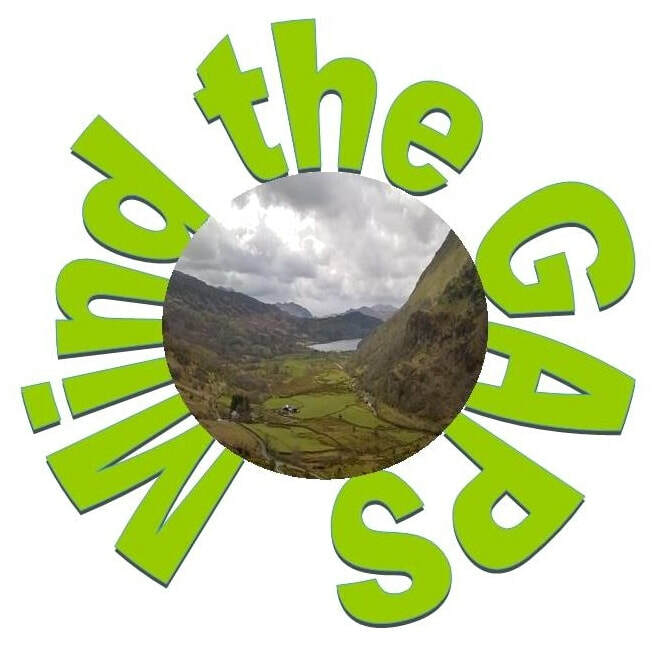 Why did we call our sight Mind the Gaps?' simply because when we started out, it felt as it there were going to literally be many gaps in our diet - things we loved that we had to leave out. Not all unhealthy - things like potatoes and parsnips. Now we are veterans, we don't mind the gaps so much. When Son 1 was asked recently if he misses 'normal food' (whatever that is, but we presumed it meant non-gaps legal foods), he replied, 'No, I'm so used to GAPS diet food.' And so we are. If you don't already know, GAPS stands for Gut and Psychology Syndrome, by Dr. Natasha Campbell-McBride, a diet to not just deal with the symptoms of many diseases and allergies, but to heal the gut and by so doing heal the body of the effects of the disease. The gut gets damaged through a diet of mainly processed foods, stress, the use of medicines and antibiotics etc.. etc... It is an adaptation of the SCD diet which has been around for many years. She formed it out of her desire to help her own autistic son. There are many gut healing programmes, but this one is particularly written with autistic, depressed, ADD, ADHD, dyslexic and dyspraxic youngsters in mind, including those who have eating disorders. It gives hope where doctors have failed. The author also has much expereince with autoimmune diseases. She addresses how to help fussy eaters too, an important aspect as many of these youngsters are very sensitive to new foods and tend to limit their diet to just a few carbohydrates and their parents think they will never get them to eat according to the GAPs diet. Help is at hand! In the case of auto-immune diseases, there is no cure as such, but they can be put into re-mission so that the symptoms are not felt. Healing from an auto-immune disease is a bit like doing a jig-saw puzzle. There are many aspects to put right including making changes to the life-style (sleep, eating, stress etc... ) and environment (removing as many harmful toxins in the home, e.g. chemicals in household cleaning products and personal products), but none of these will help if the gut still remains damaged. It can be tricky finding the bit of the puzzle that is missing (or that has triggered the auto-immune response). But the fact we have auto-immune disease means our health is somewhat compromised, so we are doing the diet to at least get the 'core' of the body back in shape. The rest we leave in the Lord's hands.